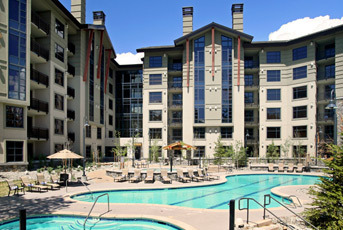 Are you looking for a piece of Mammoth real estate that will put you in the heart of resort-style luxury? Then you may want to consider filling out a change of address card that includes the words, Westin Monache. It’s a delightful condominium development within reach of the Westin Monache Resort’s finest amenities. And I do mean fine. The renowned, Mammoth Lakes resort is recognized by world travelers for its signature Heavenly Beds® and Heavenly Baths®. If you haven’t traveled in style for awhile, please allow us to explain. Initially introduced in the late 1990s, the luxurious beds are manufactured by the well respected firm, Simmons. They feature thick, lush, pillow top mattresses with reinforced edges. And they come with a choice of either low or standard profile box springs. As for the otherworldly baths, they feature therapeutic, spa-like, dual shower heads that offer phenomenal water pressure and a handful of powerful jets per head. They were custom manufactured for the hospitality chain in the early 2000s by the esteemed, centuries old, American firm, Speakman® Company. And the good news is both the beds and shower heads are often included in Westin Monache condos. In addition, Mammoth real estate owners that choose to make Westin Monache their homes have access to other, highly coveted, onsite amenities too. The long list includes a heated swimming pool, serene spa, workout room, concierge services and a restaurant. Known as the Whitebark, it serves breakfast and dinner daily. Plus, there is a fabulous lounge menu available too. Food you’re likely to encounter there are thick, all-natural elk rack chops, free range duck, bison short ribs, Kobe beef sliders and Wester Ross salmon. With rich meals like that available a fork’s throw away from one’s doorstep, it’s a good thing the condominium development’s onsite fitness center is open 24 hours! If you get tired of the onsite workout room, there is plenty that Mammoth real estate owners may enjoy nearby. For instance, you could bike the Gondola, shop at the village, hike, ride horses, swim and ski. On rainy days, there’s always a lot of indoor entertainment available in the area too. Listen to music, check out local art or catch one the latest, hottest movies. To learn more about the Westin Monache condos and grab a slice of Mammoth real estate nirvana for your own, please contact us by calling (855) GO-MAGGIE. You’re also welcome to stop by Maggie Larson Mammoth and like my Facebook page too.